IT occurred to me the other day — as my partner and I handed over $10.40 to ride the bus eight stops and 10 minutes into the city — that Adelaide’s public transport fees might be too high. It occurred to me that for an extra $2.30 each — less than the cup of coffee we’d probably buy when we got to the city — we could have shared a taxi and ridden in comfort and direct airconditioning. It also occurred to me that for an extra $3.30 each (still less than that cup of coffee) we could have taken our own car and parked all day at a council owned U-Park. And as we waited for the bus driver to find $9.60 in change to make up the $20 we handed him, it occurred to me that if the cost of riding public transport is enough to make you consider taking a taxi, something is very wrong. For those of you untroubled by the joys of Adelaide’s public transport system, let me break the fares down for you. If you hop on a bus or train or tram in peak time (that’s before 9am and after 3pm on weekdays, or all day Saturday) and you want to travel slightly further than you could comfortably walk, you’ll have to fork out $5.20. This will get you a Singletrip ticket, valid for two hours. 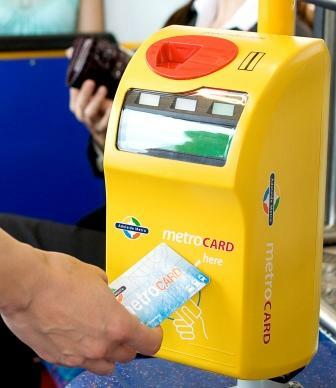 If you’ve had the foresight to buy a permanent plastic Metrocard the rate goes down to a much more palatable $3.48. The only snag with this is you have to remember to keep your card topped up with credit, something which, if you’re like me, you’ll forget about until you unsuccessfully try to swipe it and get the angry buzzer and red light of doom. You can recharge online, but not with your phone when you’re waiting at the bus stop. You have to do it 24 hours in advance, because Adelaide Metro doesn’t care about convenience. If your bus stop happens to be near a newsagent, deli or the Adelaide Metro offices, and they happen to be open, you can recharge instantly there, but there aren’t any 24-hour Metrocard machines anywhere because (see previous comment about Adelaide Metro). Now, I understand that with all the inconvenience of owning and recharging a Metrocard you need to give people at least one incentive to buy one, but an almost 50 per cent difference between the two fares is just not ... well, fair. The $5.20 Singletrip is the sort of ticket you buy when you’re caught on the hop — you haven’t had time to buy a Metrocard, or maybe you have one but didn’t realise it was out of credit. Or maybe you’re a tourist who’s only in town for a few days, and you don’t want to spend $10 to buy a card (yes, that’s how much they are) just to ride the tram to Glenelg. In fact for visitors who don’t want to invest in a permanent card there’s no real cheap way out; they either fork out $5.20 to travel for two hours, or $9.90 for a day trip ticket. It hardly makes our city easy to get around. The situation must be hard on the busies, too. Who has $5.20 in exact change? Hand over a tenner and they’re forced to give you $4.80 back in coins. And pushing fees just over that $5 mark must mean more notes being tendered, which I hesitate to suggest must put drivers’ safety at risk, particularly on night-time runs. If non-Metrocard fares can’t be lowered, then at the very least the ability to recharge your card instantly online would seem to be a very 21st century thing to do. And some Metrocard recharge stations wouldn’t go astray. In the meantime, I might call a cab. First published in The Advertiser on October 15, 2015. Click here to read the original article.